The attractions map below is best viewed on desktop or tablet devices. For a customized Central Florida Attractions Map featuring theme parks, shopping, national parks and more, visit our Custom Google Map. f ound only in Central Florida! Capone's Dinner & Show is considered an 'Orlando attraction' in the Central Florida area. We are also considered a 'Kissimmee restaurant,' so you may often find us listed under both of these categories, as well as 'dinner shows' and 'dinner theaters.' Because we are an attraction, we also offer a lot of information about other nearby attractions. 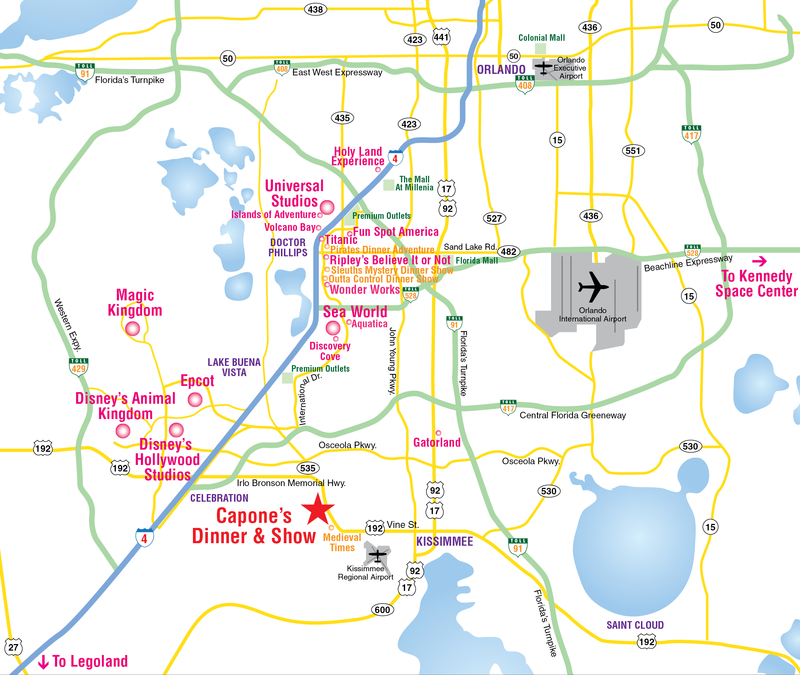 If you need more information about any attractions noted on this map, visit Al's Blog or call one of our wise guys at 407-397-2378. NOTICE: PDFs open in a new window and require Adobe Reader. If you need a PDF converted to html, please contact our webmaster.